Anybody still working on this project? Yes and no. It's still being worked, but probably not in the way you expected. I will be publishing another version of PSD-Lite that uses a file-based TS database (using the Microsoft Compact Edition database). I came to the conclusion that a centralized database for DIY'ers is too much work and not enough payback, and didn't want to follow in the footsteps of the now-defunct www.thielesmall.com effort. But with a file-based approach, people can have their own database and use some local tools to merge in database files from the web. I think that this file-based model will work OK and support a good degree of collaboration. It's not a model that purists will like, but I think it is a good practical solution that solves some difficult security and maintenance issues. I've got all of the drivers in the PE and MCM woofer selection guides, all of the ones in Mattp's posts, and all of the "good" data from the thielesmall.com database. Right now this data is in Excel and I need to move it to an "SDF" file for CE. I'm not on the computer where I have the schema, but I'll post it when I get back in a couple of days. I made an error in thinking that I could keep databases out of PSD-Lite. However if I want to keep all of the modules that are common to "PSD-Pro" and ASD identical, I had to include the TS database in PSD-Lite. Rats! The schema for the proposed database is shown below. This is somewhat expanded from the database I am currently using, so I've got to rebuild the database to include this new data. 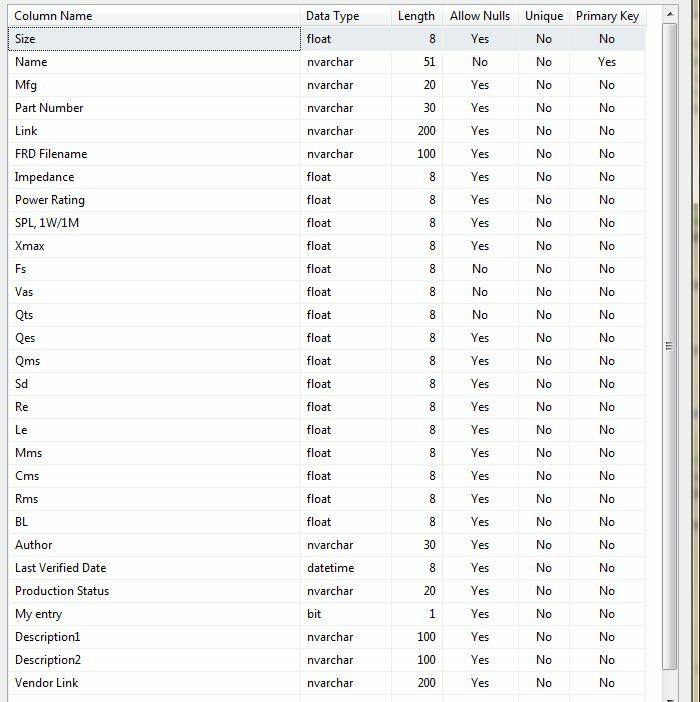 Some parameters that will *not* be saved in this database include: outside dimensions, bolt patterns, cone material, voice coil diameter, surround type, etc. Most entries will have a link to the datasheet to allow looking up this additional information. The "My entry" field is a flag to indicate that the row was entered by the user. This field should help with merging database files from other sources. The primary key is the "name" field, which is a concatenation of the MFG and Part Number fields. Would you desire information generated by DIY people on more details. Examples would be the non-linear aspects of the drivers , free-air measurements (on and off axis), impedance curves both 1 watt and high power? This thread hasn't had a new post since Sept 2013. It's useful information, but it takes up valuable space as a sticky on the main page. Can we move this to the OmniMic Forum or can PE find a place to host this Excel file? The Excel file has all of the T/S data posted in this thread in a single place. Anyone know the source of "actual measured" parameters for the Pyle PDW15125 ? Those numbers are not even remotely close to advertised (Qt = 0.4 vs Qt = 1.295) I'm looking at this driver, but not if the specs are anything close to the ones in this spreadsheet. Unless there's been some significant mfg. change in that driver (which, more often than not, would result in a revision to the model number - but NOT ALWAYS), the WT3(DATS) data SHOULD be good. This thread was initially posted 3-1/2 years ago, from data the OP had collected over some (previous) time. So . . . THAT Pyle driver MIGHT have been measured 10 yrs. ago (or even more), but certainly at least 4 yrs ago. Qts is really not a measured value. It's calculated from the measured values for Qes and Qms, which are almost always VERY accurately measured with something like a DATS or WT3 system (as opposed to Vas, which can/will vary due to operator errors). Fs is also very accurately measured. In the case of that Pyle: Qts (approx. )= 1.8*4.6 / (1.8+4.6), or . . . 8.3 / 6.4, or about 1.27 (I'm rounding, a LOT). So that measured (calculated) Qts value that's listed as 1.29 is most likely accurate. Not sure about the copper but the decimal is in the right place. Last edited by smithclarkson01; 04-04-2019, 05:19 AM.